This cruise port has a very relaxed feel to it compared to the cruise port in Fort Lauderdale when we last cruised. 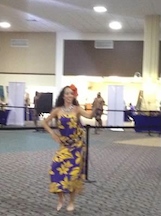 The line to go through the inspection process goes very smoothly and quickly, we are given fresh flower leis and we are at the check in desk in a matter of a few minutes, all with beautiful Hawaiian music playing and hula dancers performing! It was awesome!